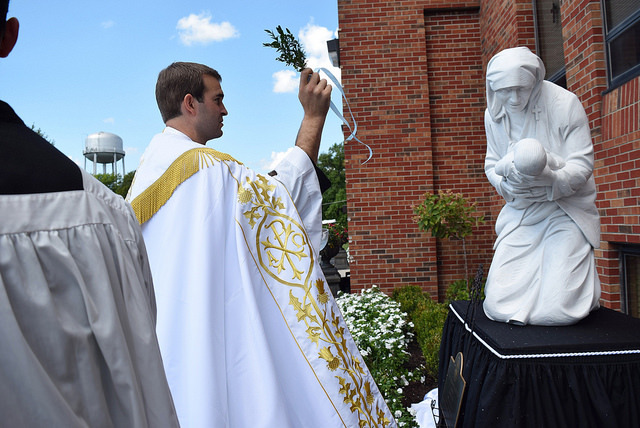 Benedictine College unveiled a new statue of St. Teresa of Calcutta and presented Fr. 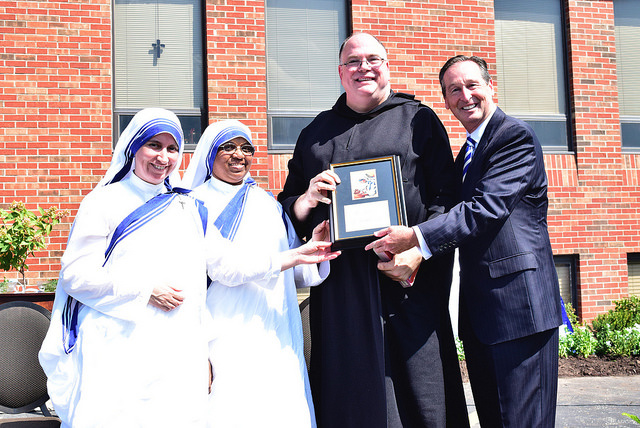 Meinrad Miller, OSB, with the Do Something Beautiful for God Award on September 2 as part of Mother Teresa Days on the school’s Atchison, Kan. campus. 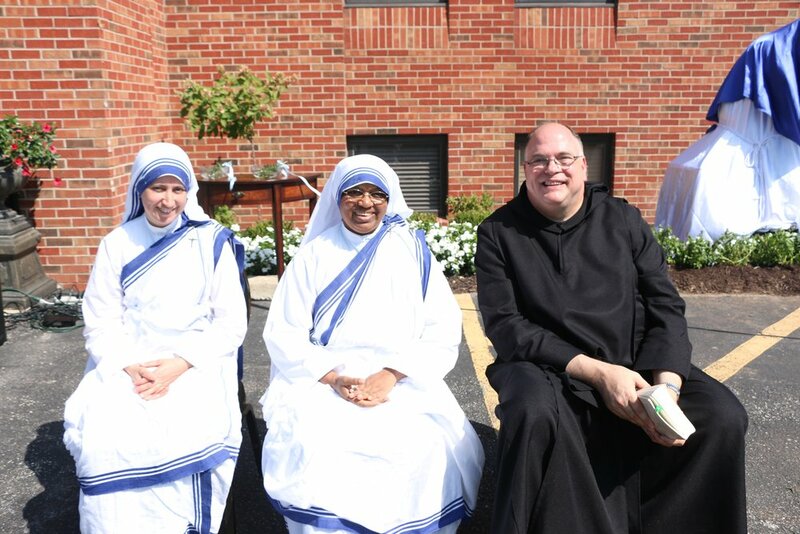 Two sisters of the Missionaries of Charity, the order she established, were in attendance to help with the ceremonies. Fr. Simon Baker then blessed the statue. 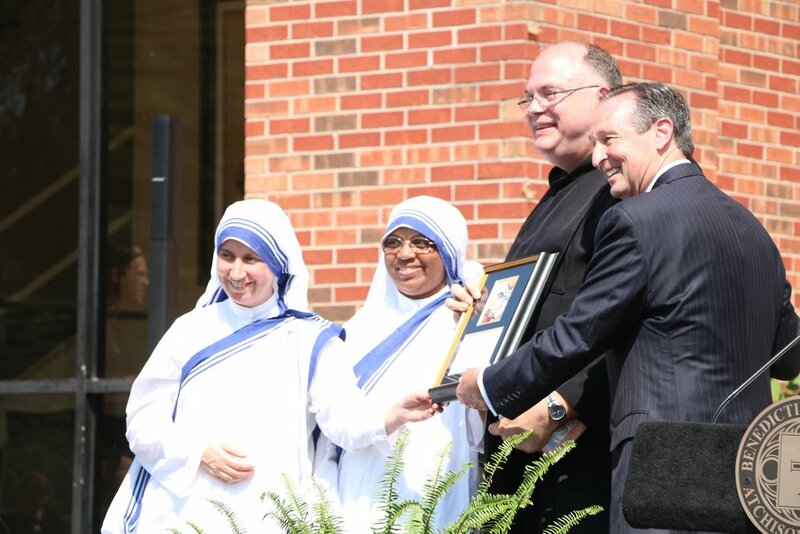 “This statue is based on the painting you can see inside the Mother Teresa Nursing Center and is a fitting reminder of what Mother Teresa has asked of us and especially our nurses: ‘to give our hands to serve and our hearts to love,’” said Benedictine College President Stephen D. Minnis. Sister Trinidad, MC, and Sister Flora, MC helped unveil the white marble statue and also helped present the award to Fr. Meinrad. They said they were honored to be invited to the ceremonies and passed out special commemorative medals and prayer cards. Fr. Meinrad came to Benedictine College in 1984 from the small town of Leoti, Kan. Known then as Stanley Miller, he immediately became engaged with social service activities on campus and was part of the group that started the Hunger Coalition, now a mainstay of service to the needy of Atchison. He was one of the first students to ever deliver sack lunches in the town. While on campus as a student, he was also a member of the Chamber Singers and Knights of Columbus. He graduated in 1989 with a degree in Religious Studies and a minor in Music. He heard God’s calling to the priesthood and went on to earn his Masters of Divinity at St. Vincent’s Seminary and joined the ranks of St. Benedict’s Abbey. He served Benedictine College as Chaplain from 1994 until 2010 and still teaches in the Theology Department. He also serves the faith formation of our young men and women as Chaplain at Maur Hill-Mount Academy. Within the Abbey, he is Director of Oblates. In 1997, while serving as Chaplain, he began working with Dr. Ted Sri and Curtis Martin to start the Fellowship of Catholic University Students. 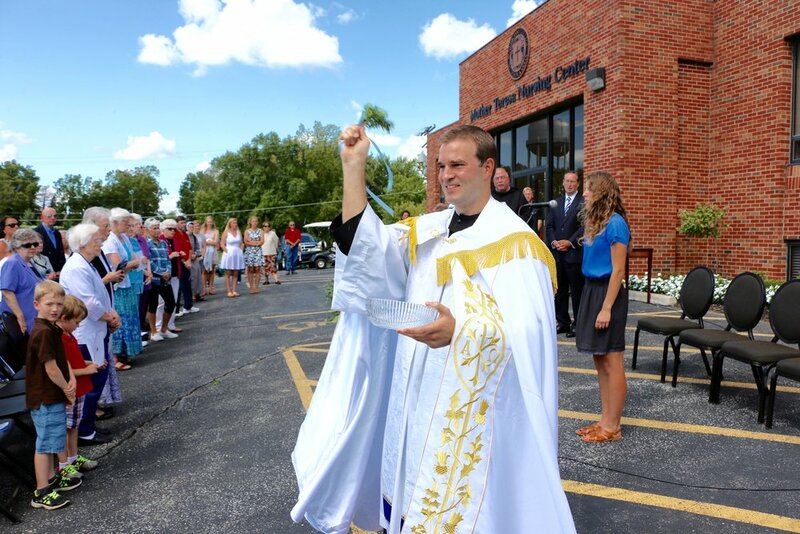 FOCUS officially began in 1998 with two missionaries on the Benedictine campus, and the organization now has more than 550 missionaries on 125 campuses nationwide. In 2008, he began his work with the Missionaries of Charity, offering seminars and leading them in retreats, helping them to accomplish their mission. He worked with the St. Louis house and in 2011, made his first trip to Calcutta to visit the Motherhouse. There, he gave a talk to the missionaries about the Paschal Mystery.